As soon as I hear somebody talking about travel plans, I start seeing the opportunities to paint my name abroad. A trip to Düsseldorf this weekend was because of that opportunity, being a fun thing to look out to. Buying paint for that particular trip, sketching and using Google maps to get familiar with the Hall of Fames, it doesn't help not to think about all things that could go wrong haha. Okay, fast forward to past Saturday. Due to a deal at the Hilton Hotel we got free one-day-cards to travel the public transport. After the recent trips to London and Berlin, I recognised the feeling that got to me while getting into the U-Bahn; Some sort of sweaty, nervous anxiety, that 'I hope everything falls into place' feeling. On the other side I really wanted to paint. After a little 70% German and 30% English chat with some Fußball guys about me being some sort of 'kunstler', we got out at the Vennhauser Allee. What a wall. Such sick work from Semor and other artists, and some really sick collaboration walls. 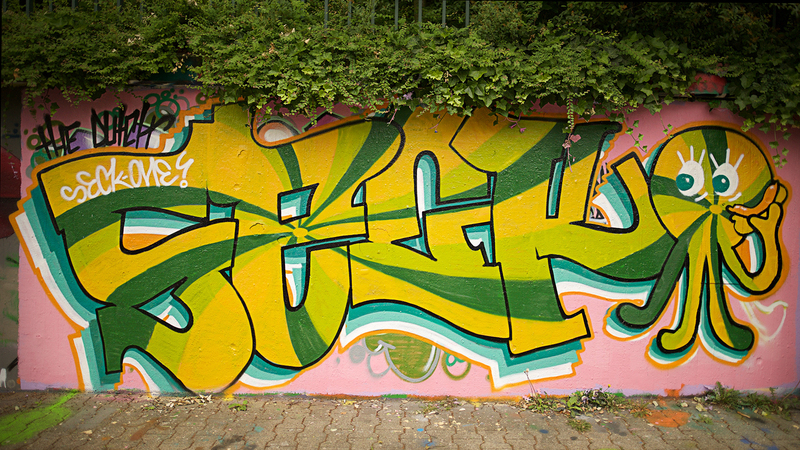 A must see if you are going to Dusseldorf and you like graffiti & street art! In my piece I tried something new with my fill. Hope you enjoy!